Once you’ve found the person you want to spend your life with, you’ll do anything to keep your relationship strong. And sometimes, money problems and debt stress can make that tricky. Even though talking about your finances can be scary, bringing it up now could help you avoid future relationship or marriage issues and create a deeper and more supportive connection with your partner. Here are some simple ways you and your partner can overcome debt and build a better life together. When you’re in a serious relationship, honesty is always the best policy—especially when it comes to money issues. Letting your partner know about your money problems is important if you want a relationship based on honesty and trust. Plus, being truthful about your debt could lead to more open communication in all areas of your relationship. If you keep your debt a secret, you could be creating tension in the relationship without even realizing it. Talking openly about student loans, credit cards, personal loans, and other forms of debt with your partner could help bring you two closer. And chances are, they may have some debt of their own to talk about. These discussion don’t have to be too serious, either. Why not make a date of it? Each of gets a free copy of their credit report at www.annualcreditreport.com, and then you can go over them together. Learn how to tell the difference between good and bad debt here. After you two have talked about your debt situations, sit down with all of your bank and credit card statements and identify unnecessary expenses together. This is a problem both of you can solve! Look through your statements and highlight “Needs” like your mortgage, car payments, and insurance in one color. Highlight “Nice-to-Haves”, like gym memberships, cable, or high-speed internet, in another color. Finally, highlight “Wants”, like entertainment or expensive restaurants in a third color. Once you create these three categories, discuss and debate which expenses you can afford to cut as a couple. Then, plan out how much you’ll each put against the debt each month. Budgeting, cutting back, and paying off debt isn’t always easy. But knowing that you have someone on your side who supports you and wants the best for you could give you the extra motivation you need to get out of debt. By encouraging each other and committing to a common goal, you won’t just improve your financial wellbeing—you could also strengthen your bond as a couple. Getting out of debt could take a long time, so it’s important to break your ultimate goal into smaller, more manageable ones—like staying on track with your monthly budget, paying off a credit card, or reaching other milestones in your debt repayment plan. After achieving each of your goals, reward yourselves with a night out, a bottle of wine, or a special home-cooked meal. Just remember to stay within your budget. You could even make a game out of the weekly goals you set for yourselves. For example, one week you could have a contest to see who can save the most money. Whoever wins could get to choose the next movie you watch, get a neck massage, or have a pass from doing their least favorite chore for a few days. Celebrating your victories together could keep you and your partner motivated throughout the process of solving your money problems. Why do couples fight about their finances? Because money problems put pressure on each person in the relationship, creating feelings of guilt, fear, and anxiety that can make them lash out or act irrationally. If you’re worried that debt is starting to negatively affect your relationship, it may be time to get professional help. Some people try financial counseling for couples, where you and your partner talk to financial expert or a representative from a credit counseling agency about how to deal with your debt. Using this method, a credit counselor may be able to reduce the interest rate on your credit card debt if you enroll in a Debt Management Plan. However, if you and your significant other are experiencing a financial or life hardship, or struggling to make minimum payments on your high-interest debt, a better plan may be to enroll in a debt settlement program together. 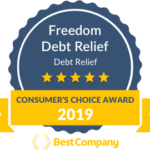 And since you can enroll as a couple into our program, Freedom Debt Relief could be the perfect option for you. After enrolling in our program, our expert debt negotiators will work on your behalf to reduce the total amount of debt you owe your creditors. That way, you and your partner could save more and get out of debt faster than making minimum payments. Learn more about how our program works here.